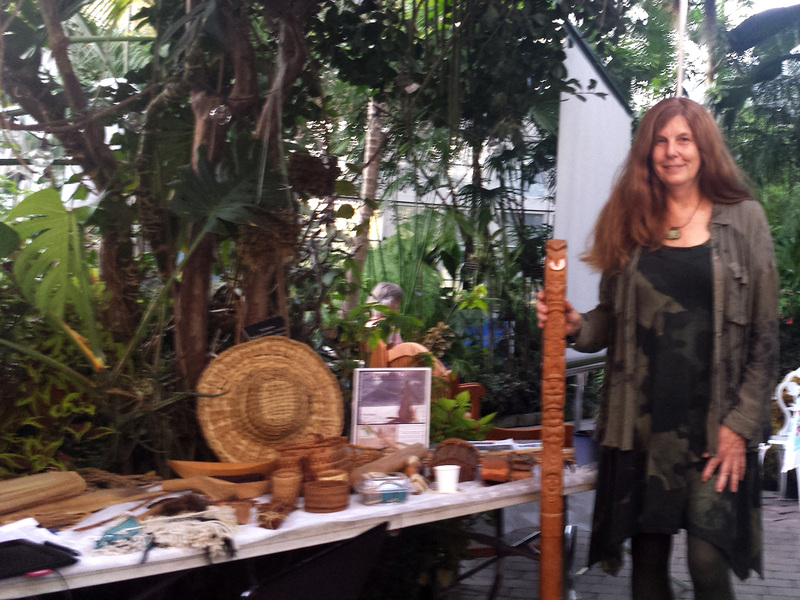 I am pleased to offer presentations to organizations, groups and schools on a variety of subjects related to my book, my work as an ethnobotanist and with native plants. The following are ones I have offered and refined over the last many years and which can be adapted to your particular situation. My presentations are highly visual with many historical paintings and photographs, my own artwork and photographs and interspersed with stories and personal experience. I bring lots of hands-on materials, and objects related to the subject. My fees vary based on the audience, location, and subject but generally are priced in the $200-400 range and typically run from 1-3 hours long. I often extend presentations with hands-on activities or plant walks. If you are interested in a program or activity for your group or class please fill out the form below or contact me directly. This presentation provides an overview of the daily life of the people of the Pacific Northwest before European contact; following the harvests of the seasons from the Warming Time through the moons of the Hot Time and back again to the moons of the Cold Time. This is an interactive presentation with digital images, hands-on artifacts and demonstrations; including samples of traditional foods, baskets, tools, clothing, artwork and more. 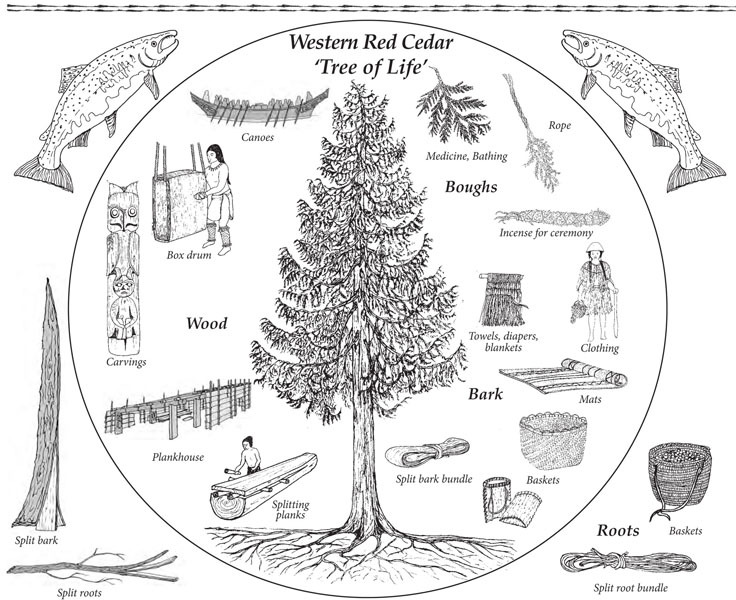 Western Red Cedar is the ‘Tree of Life’ to the people of Cascadia, used for housing, transportation, clothing, containers, tools, medicine, ceremony and more. Students will learn about these uses with slide show images and lots of hands-on and interactive activities such as splitting a cedar plank using a yew wedge, texturing with an elbow adze, assembling a plank wall using alder poles and cordage, splitting red cedar bark and much more. This program is designed as an overview for new learners about the people who lived in and around Puget Sound. Learn about the housing, clothing, food, art, language and other cultural elements which define this region as the Coast Salish people through slide show images, hands-on artifacts and objects, and interactive participation including cedar, wool weaving, traditional foods and more. Suggested activity extensions: Cattail Mat Houses, Northwest Weaving with Wool, all cedar activities (above), Ethnobotany plant walk. A presentation about how I came to write and illustrate this book, adapted to your age group, with powerpoint images, and stories, props and more. I discuss my research methods including first person and primary source documents, and bring some of my original drawings showing source notes. I also share some of the final pen and ink drawings and share some of my drawings techniques and my inspirations and motivations for writing and illustrating this book, along with the impacts this has had on my life. 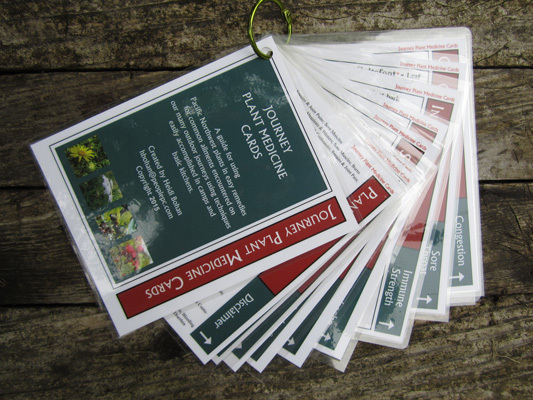 A very hands-on, interactive presentation learning about the key and commonly available plants to use for herbal first-aid while out and about on our many journeys. Learn basic plant identification of the plants of the season and those that are important to know year-round. Practice basic techniques to make poultices, infusions, soaks, compresses and syrups ready to use from fresh plants you find along the way here in the Pacific Northwest. This program ties to the ‘Journey Plant Medicine Cards’ available here. This program is generally 3-4 hours long. This activity introduces students to the amazing properties of the inner bark of the Western Redcedar tree which was used for objects throughout the daily life of the People of Cascadia, from containers, clothing and mats to rope and line used in hunting and fishing. 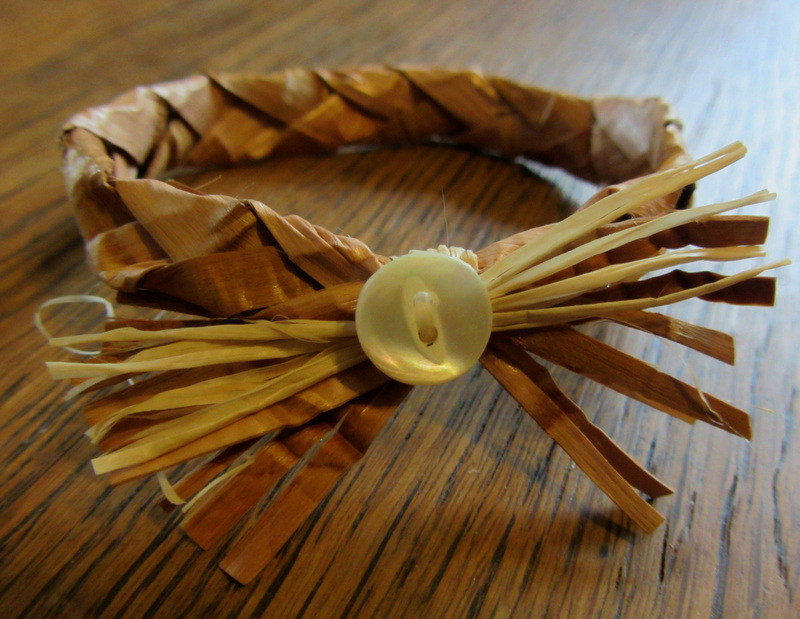 Each student will make a bracelet (or arm band) from prepared cedar bark, using a ‘diagonal plaiting technique’, a form of braiding. After completing the bracelet they can further decorate it with an ornamental button and fringed fiber in natural or various colors. This activity is appropriate for 3rd grade to adult. This activity introduces students to the many ways that the people here use the common, yet extraordinary cattail plant for housing, insulation, mattresses, seating and many other uses in daily life. Each student will make a small cattail mat using the authentic ‘sewn’ technique, bound at the ends with twining. These mats can be further used to create summer house or other dioramas. This activity is appropriate for 3rd grade to adult. This activity introduces students to the important role that wool from Mountain goat and a specially bred wool dog was used in the making of wool robes, blankets and clothing items here in the Pacific Northwest. Each student will use a model of a ‘two-bar loom’ to weave a small weaving using various colors of yarn which replicate the natural dyes used in this region. Students will also see a demonstration of how wool can be dyed with easily found natural materials. This activity is best for students 4th grade and older. If you are interested in a proposal for your program please provide the following information and send to hbohan at peoplepc.com and I’ll get back to you! Thank you for your interest! Your name/ Name of school or organization/location; Programs and/or activities you are interested in; Age and rough number of participants; When? please suggest a few dates and schedule; anything else you think I should know?